Disinformation, is false information, or deliberately misleading information, often put out as propaganda and that is what the Arabs, headed by Mahmoud Abbas-Abu Mazen, and their cohorts, the anti-Semites of all sort and their cohorts are using to delegitimize and demonize Israel. Israel has got ONE effective tool to use, that is the truth and it must use it offensively. Ryan Mervin, claims that Israel is the world’s first modern indigenous state. Ryan is a Metis from Paddle Prairie Metis settlement in Canada. His father, Mervin Bellerose, co-authored the Metis Settlements Act of 1989, which was passed by the Alberta legislature in 1990 and cemented the Metis’ land rights. Ryan founded Canadians for Accountability, a native rights advocacy group, and he is an organizer and participant in the Idle No More movement in Calgary. And he is a Zionist who visits Israel frequently. Ryan guides many Israelis and many have taken on his guidance, among them Knesset members, to start making the claim, be recognized, defined and proclaim themselves as the Indigenous Population of Eretz Yisrael, meaning the Land of Israel, AKA Palestine, an arbitrary name to some. What struck her the most about Ryan’s lecture she attended is the fact that the term “indigenous” is not just about blood quantum, a way used to determine an individual’s tribal affiliation and legal rights to land, to a territorial scope. According to Ryan, and now Batzi, being indigenous is also determined, among some other factors, by the preservation and management of recognized Holy Sites. If this is one aspect of holding indigenous status that Jews are good at, it is certainly the way they revere and manage their Holy Sites, some are Biblical and are thousands of years old. The reverence for these sites, the constant longing to visit them and pray in them has been expressed in Jewish ancient prayers, their literature and art. Ryan, being an activist for Indigenous Canadians, recognizes and appreciates these facts. This aspect of Jewish indigenous affiliation has been very instrumental in Ryan’s desire to organize a trip to Israel, which, he believes, will help his people experience what he has. His message is very powerful, a tool every Israeli must adopt. This is the precise description of the Jews in the Land of Israel. If the Arabs have a similar claim, there no reason for them to prioritize their claim on account of the Jews, rather accept them as equal. Reading this description refutes any claim that it does not describe the Jews of Israel and their connection to and affiliation with Eretz Yisrael-The Land of Israel. And with that, will there be someone to rise up and say that this definition does not legitimize the Jews’ claim to this land, to their ancestral land? How about starting with the people in Israel who use the wrong terminology and narrative and have the wrong approach? Then, once the Israelis have had their lesson and learned it well, the next one to teach is the U.N and then each and every person on earth who still objects to Jews being the indigenous people of the Land of Israel. To strengthen this claim one has to take action and act the part. 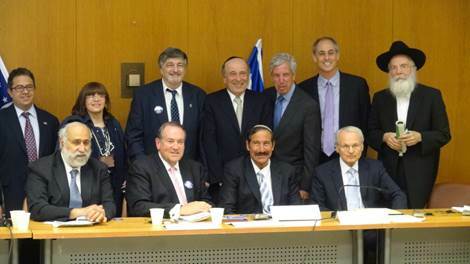 At the recent Conference of the Committee Against the De-Legitimization of Israel held in Jerusalem attended by Governor Mike Huckabee, members of Knesset, head of organizations and Jewish patriots strong words were said as to how to go about taking action in defense of Israel. It is nonsense that people say they have nothing against Jews, rather against the state of the Jews, Israel. Can we say, for argument’s sake, we have nothing against the Irish, Italians or French but Ireland, Italy and France should be destroyed? So it is hostility against the Jews, it is anti-Semitism wearing a modern dress. According to Morton Klein, the president of the Zionist Organization of America (ZOA) words matter. Using the wrong words delegitimize Israel, they cause damage even can end up in killing. Therefore, Israelis, Jews and advocates for Israel should use the right and accurate words in telling the truth, as oppose to the words the media and Israel’s enemies want them to use and they use themselves. Stop saying, Arab-Israeli conflict. It does not exist. Instead say, the Arabs’ war with Israel, because that is what it is. Stop saying, “peace process,” rather, maybe say, ‘negotiating process’; we know it is not leading to peace so do not give legitimacy to it by using this term. Stop saying, “we do not have a partner [to peace],” that gives some legitimacy to those arrive to “negotiate.” Rather, tell what Abbas is. He is the enemy, who does not want peace. We have to demonize this Jew and Israel hater. Stop saying the words “two states solution.” Israel is already a state; by using this term it is as if each side is getting something out of it. You can say, the ‘fraud Palestinian state solution,’ and by that you are not ignoring the fact that Israel is already a full-fledged state. Between 1947-to-1967, when the Arabs controlled Judea and Samaria and Gaza, they did not think about establishing and did not established a state, because their goal is not a statehood. All these terms are made to destroy Israel and nothing will work until the Arabs realize that it is hopeless for them to try destroying Israel, but that time has not come yet. Stop saying the words “West Bank.” Menachem Begin came to America and begged the Jewish leaders to stop using these two words’ term used by the Arabs to deJudaize Judea and Samaria. We should, forever, use the names Judea and Samaria. How difficult is it? Stop saying and using the term “settlements.” These are Jewish communities, not settlements, as if they are a bunch of tents on a hill top somewhere. Let us call this racism when people say that 350,000 Jews, presently living in Judea and Samaria, should not be allowed to live there. We need to ask why is it that 350,000 Jews cannot live among one million Arabs living in Judea and Samaria, but 1.5 million Arabs can live among 6.5 million Jews in Israel. Whoever disagrees is complicit to racism and anti-Semitism. We should call a spade a spade. Stop saying that Jerusalem is holy to Moslems; that is a propaganda lie! The word Jerusalem does not appear in the Qur’an, ever. It however appears 700 times in the Jewish Holy Scriptures. From 1948-to-1967 when the Arabs controlled the eastern part of the city, no Arab leader visited it and they allowed the city to remain a slum. We must stop acting as if the Arabs have any religious, historic, or political right to Jerusalem and stop acting as if we have to make a deal about Jerusalem. Aren’t you sick and tired of the lies? After all there is no basis to their argument and the Arabs have no right to make it their argument. Stop helping the BDS movement (Boycott, Divestment, Sanctions) by using the word “occupation.” There is no occupation. Israel has already given away almost half of Judea and Samaria, where 99% of the Arabs live. They are running their own lives there except for security. If they were not constantly developing terrorist cells, trained to murder Jews, Israeli forces would not have to be present in Judea and Samaria, in the areas that Israel gave away. Let us make it clear to the world that the Jewish communities comprise only 3% of Judea and Samaria when the images all over the place in to the contrary. I wish it wasn’t this way but it is. Since the Oslo process began in 1993, no new Jewish community was built, only Jewish homes in the boundaries of the legal existing communities; and let us constantly remind the world that Israel gained that land in a defensible war in 1967, land that Jordan occupied, illegally, from 1948-to-1967. More so, in 1988 King Hussein relinquished all claims to Judea and Samaria, a claim he never had to begin with. This land falls under the unallocated international land status. Therefore, of course, there is no occupation and the Jews have the greater legal, political, historic and religious claim to it than any Arab or Moslem ever did. We should condemn, with all of our hearts and souls, the old-new alliance of Hamas and Fatah; Fatah’s alliance is with a Nazi group whose charter calls for the murder of every single Jew on earth. What the USA, the EU and the UN have done is nothing short of diplomatic Kristallnacht. Not only that they have not criticized it, they have embraced this alliance and agreed to negotiate with it and fund it. How discreditable. We should make it clear that this is called the Promised Land and we should ask everyone, who promised this land and to whom did He promise this land. Because God promised this land to the Jews and God does not break His promise. The name Im Tirtzu, means, ‘If you will it’, name based on a phrase by Theodor Herzl. It is a Zionism and idealistic movement for national self-determination of the Jewish People, a Zionist extra-parliamentary group, based in Israel, defending Israel. According to Im Tirtzu, Israel’s adversaries are crossing international borders and Israel needs to cross international borders as well and work together with her supporters to counter them. They see a phenomenon of ‘self-anointed saviors,’ in the USA and the EU, who think that they have all the answers when it comes to Israel. They have decided that when it comes to Israel’s vision, Israel is expected to adopt their vision, meaning make certain concessions, adopt and drop certain policies, all, ultimately, for the greater good of Israel, because they know better than the Israelis. A lot of it is to protect Israel from herself. Because they know better what is good for Israel, part of their vision is that maybe, there should not be a Jewish state and maybe it should simply be a state of its citizens who live with diminished security, in Auschwitz borders, all in the name of “rescuing” the Jewish nation. More so, they believe in tough love with those stubborn and short sighted Israelis. So the Israelis’ modern “saviors,” the self-anointed ones, are going to use some tactics, like boycotting, divestments, sanctions, all for the greater good, all for bringing Israel back to line because somehow they know better than the Israelis themselves. Im Tirtzu tasks us to ask the following question: What do we do and how do we react to this toxic, corrosive and pervasive state of affairs? Do we subject the State of Israel to death by 1000 cuts or, do we call out the self-anointed ones? Do we expose them for their duplicitous conduct, for their two faced behavior, for their empty expressions of support for Israel even as they make common cause with the true enemies of Israel? By now we need to know the answers. Time to call these people out and expose their two faced behavior. We need to point finger at those European sponsored NGO’s who give huge sums of money to organizations that are not accepted in Israel and shine a light on what they are doing. So, start shining a bright light on all the darkness we have put up with thus far, NOW. Remember, hypocrisy and disinformation have no boundaries, have no shame. They are tools in a psychological and political war, now being used against the state of Israel. If a Russian child went missing under the same circumstances as the three boys, kidnapped by terrorists in Israel, Putin would have ordered his army to level one village after the other till the boy was found. But since the Jews fall under singled standard no other country will agree to operate along, Israel is required to continue life as if nothing happened. The boys’ lives are insignificant to the world out there. And the United Nations Human Right Council is much more concerned about the rights of terrorists than the rights and lives of three Israeli teenagers, kidnapped on their way back from school. Speaking about a nauseating world, this one is for sure! Time to go on the offense, and how! If we, Jews, and those who support Israel, do not change the lexicon so wrongly being used daily, if we do not tell it as it is, if we do not speak the truth and the truth only, the attacks on Israel and Jews will only be embolden and strengthened. Stand up and be counted and accounted and from here on use a totally new approach. Our togetherness will win the uphill battle.